Hens who Dance! Are you Ready to Boogie? Hen party dance classes and hen dance lessons. Get into party mood. Whether you are looking for a sensual, sassy or sublime, one of these dance workshops is sure to “craic up” a smile and laughter. Led by a professional performer and dance teacher, these classes are the ultimate fun activity for a group of friends, family or workmates. 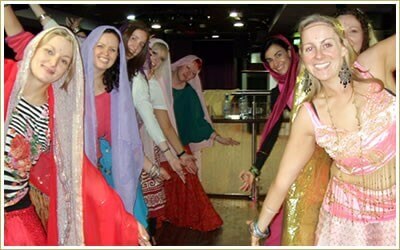 The dance instructor also specializes in hen parties, and even co-ed hen & stags! The music and moves will definitely put you in the mood, and the themed costumes and props are the icing on the cake! Package price starts from €65 per person. Includes themed dance class, accommodation and one glass of Prosecco on arrival. Disco: This unforgettable and exciting 70s disco routine will have your group, strutting on the dance floor again and again—even those with two left feet. Outfits are provided and you’re also encouraged to wear your own boho or afro wig! Burlesque: Unleash your inner seductress with this fun and flirtatious dance. Embracing the wonderful art form of burlesque—without the stripping— this programme is appropriate for everyone! Includes feather boas and a special outfit for the bride-to-be or guest of honour. Bollywood: This workshop involves a fun and hugely popular Bollywood routine that will make you feel like you are dancing in Slum Dog Millionaire! The beautiful motions combined with music, costumes and group dynamics create high spirits! Thriller Dance: It is the one and only Michael Jackson Thriller Dance—you know that legendary music video routine you have always wanted to learn? This option is a blast for hens of all ages. Complete dress-up is provided, including a spooky wedding dress for the bride-to-be. The Art of Bellydance: This dance routine offers sensual and enchanting choreography, allowing you to move your body like you’ve never before, while feeling beautiful inside and out. The gorgeous costumes create visual splendour, so don’t forget to bring your camera! Time Warp: Yes folks, it is the famously addictive Time Warp from The Rocky Horror Picture Show. This is not only the easiest of the dance programmes, but also the funniest, and includes Rocky-themed costumes! 60s: If you are a fan of all things 60s, from juke box tunes to rockabilly fashion, then this new dance workshop is for you!